I’ve been itching to work on my story telling skills, so have decided to pick a memory and get writing! An inspiring little story telling website I came across suggests delving into your firsts, worsts, bests, and tests as fuel for your stories. Here’s a story of a memory that I cherish. The heptathlon schedule usually caters nicely to heptathletes. A minimum of 30 minutes is required between events, and we often get somewhere between 45 minutes to an hour, plenty of time for a washroom break and a check in with the coach before migrating around the track to the next competition setting to begin warming up again. However, the schedule at major championships is often far from ideal. Hours break up the flow of events, and a new challenge of keeping sane is added to the long list of mental and physical components that contribute to a great performance. Such was the case in the heptathlon at the 2011 FISU Games. It is mid day 1 and I am sitting on thin crash mats with the other heptathletes in the blindingly white multi event room somewhere deep within the stadium. We finished high jump what feels like eons ago, and we still have a couple of hours until our next event. I am drawing my own feet to pass the time. The sun is already out of view from track level when our shot put competition rolls around; the high walls of the stadium conceal the horizon and make any subsequent estimation of the time of day all but impossible. I feel immersed in a dream with no real sense of time, and nowhere else I could imagine wanting to be. The shot put competition comes and goes, complete with its mini dramas for each of us that are quickly abandoned in true multi event fashion, with the next challenge that lies ahead, the 200m to round out the day, commanding our immediate focus. Continuing the wonderfully relaxed trend of the day, I trek happily back to the multi event room for a brief respite, then on to the warm up track to prepare for the race. The marshaling procedure deserves an entire story unto itself. Checking in as close to the final minute allowed to us as possible, we are guided into chair lined corrals according to our race section, with the only opening to each compartment guarded by clipboard bearing officials requesting to measure the pins in spikes, tape over big logos of brands competing with the meet sponsors, confiscate odd items from your bag that could offer a competitive advantage only in a freaky alternate universe, checking and rechecking your bibs, and distributing hip numbers (which stick on our hips for all of 10 seconds in China’s August humidity). We emerge into a big cave-like room housing a few more chair corrals (unchaperoned, this time) and a 50m several-laned straightaway. As we follow our unique prerace rituals, closely listening to our bodies so we’re neither too loose nor too tight, too hot nor too cool, too wound up nor too laissez faire, officials and volunteers are on walkie talkies waiting for our cue to enter stage left, one race section at a time. When it is finally our turn we gather our belongings, steady up into ranks based on our lane assignments, and head out into the fallen night. The fresh breeze that hits my sweaty face feels delicious, and the openness of the brightly lit stadium with the gaping dark hole leading to outer space above is humbling after the tight, stale, confines underground. The ruckus of the enthusiastic crowd in the packed stands and the commentator announcing busily in a foreign tongue overwhelms my ears, while my eyes involuntarily flit from the cameras swooping overhead to the athletes racing by on the track or down the runway as we march past to our starting line. For the first time in my young racing career I had not been wrapped up in my own cocoon of nervous excitement before a high school race several years ago. I was not focused on the blocks that I had to set, nor tuned in to my body, nor was I spending the precious few moments before the starter calls us forward visualizing my race strategy. Instead I had been chatting with my friend in the next lane over. It was then that I first recognized that I do well when I adopt a certain competition mentality, and that knowing exactly where that zone lies and how to get there is invaluable information. Although turning inward had, until that race, been an automatic adjustment that I made naturally, I learned to recognize when I’m not there automatically, and what I need to do in order to be consistently ready to perform. This lesson was put to good use once again. Our parade pulls up to the staggered starting line at the start of the corner. I place my things in the basket behind my blocks (to be taken to the finish line as we race) and I dutifully set my blocks, my head back in the game. With long minutes stretching out until our precisely forecasted race time, and my preparation perfectly complete, I sit on the big plastic lane marker and work to dim the excited humming in my head. At last, all inside is quiet, relaxed, and content, and the sounds, colours, movements, and lights surrounding me suddenly shine with an ultra vivid glow. Mass movement in the stands ahead of me catches my eye and I watch a giant spectator wave make its way around the stadium. I take it in with my blank mind, simply observing with a smile on my face as the wave rolls around again, and again, a swelling roar accompanying the flailing arms as it approaches. The focused energy of those involved serves to reinforce my own focused energy, and I load myself into the blocks feeling better than ever. The race itself is a blur, as most races are for me. Actually, after the race is quite a blur too, as if the film in front of me was set to fast forward. Someone hit the play button some time later as my teammate Natasha and I lay on the high jump mat at the warmup facility outside the stadium, giddily reflecting on our new personal best times. Our bare feet, damp from doing strides in the dewy grass in efforts to ease out the lactic acid from our muscles, dangle over the edge of the matt, and our eyes scan the darkish sky for any hint of stars bright enough to penetrate the stadium’s glow. This race is one of my proudest accomplishments thus far in my athletic career. To contend with so much unknown through a long and draining day, and to maintain focus enough to set or match personal best performances in just about every event, feels like a grand feat. My psychological tool belt, ever hanging at the ready, is all the better stocked after this long day. No matter the crazy schedule or whatever else is thrown my way, I am confident I have what it takes to come out on top. I’m sitting poolside in the dark, under the stars. Warm light is spilling out of the open windows onto the patio, while the distant crack of billiard balls, the revving of a virtual race car, and plenty of friendly bantering and laughter meld with the bubbling sounds of the hot tub. They say a picture is worth a thousand words. This place feels like another planet. The dry heat instantly wicks the sweat off your skin and I don’t think I’ll ever get used to the bizarreness of the desert landscape. My body also feels different. I realize I say this before every competition, alluding to my ongoing development, but I truly feel that I am in the best shape of my life. I feel stronger, faster, and more fit then ever. I’m ready to continue my focus from last year and compete hard, trusting the training behind me and turning off my brain. This house that we’re renting for the week is beautiful. The pool and hot tub are patiently waiting for me to finish the heptathlon in order to be enjoyed more thoroughly, and the pool table and my cloud of a bed have been resplendent amenities in the meantime. I’m off to relax and prepare for the coming day! The men’s decathlon kicks off at 11:30 mountain time (no daylight savings! 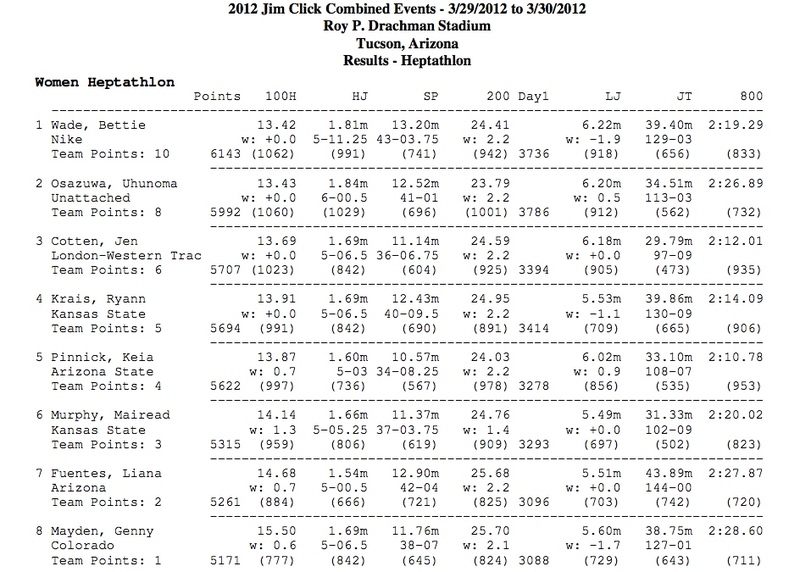 ), while the heptathlon starts with the hurdles at noon. There is information available here on the University of Arizona Wildcats website if you’re interested. Here’s one more panorama for good measure. In case you can’t tell, the 360 panorama app comes highly recommended!! !